See the First Photo of ‘Teen Mom OG’ Star Gary Shirley’s New Baby & Find Out Her Name! Gary has expanded his family! 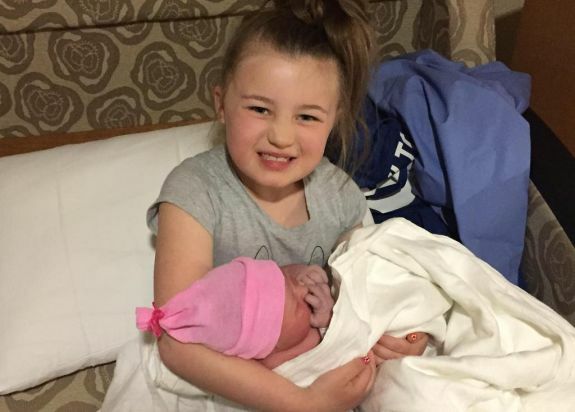 Teen Mom OG star Gary Shirley and his girlfriend Kristina Anderson welcomed their new daughter on Thursday night, and now Gary has shared the first photo of his baby– and her name! The baby is Gary’s second child, as well as Kristina’s second child, and is doing well, according to Gary’s social media posts. The little girl reportedly weighed in at 7 lbs, 11 oz at birth. He also revealed his daughter’s name: Emilee! We do not yet know whether or not Emilee’s birth was filmed by MTV, or if it will be added to the existing ‘Teen Mom OG’ Season 5 footage. Not a fan of this “ee” trend that the Teen Mom gang loves so much. Emily is a very popular (and pretty!) name for little girls, but naming her Emilee doesn’t make it any less common. She will still essentially be an Emily, but she’ll have the added aggravation of having to correct people for her whole life. Seriously Leah is too cute for words!!!!! Some people love to whinge. About anything. Wha wha wha. From his weight to his little babies name. Jeez!! They say “whinge” in other countries such as Australia. Maybe she’s from another country. Seriously, this poor girl is going to have to spend her life explaining “Emilee, with two ‘e’s.” At least it’s semi-logical, I go to school with an otherwise rational woman who named her son “Phoenix”. Which would have been kind of a cool name. Except that she spelled it “Fenix”. I’m pretty sure I’d change the spelling when I turned 18. I hope he is learning how to be a better father, man and overall human being, doesn’t look like it, but hopefully it’s not too late, and I hope he starts to get serious about his health, so he’s around to see both girls grow up!